Q: Where does the time go? A: uhhhh... Not sure. Seems like maybe something happened between now and the last blast of McMusical musings. It’s all a bit hazy. Oh yeah! There was that Hoedown at the Haus with the ever effervescent Billy Flynn (you missed that? see poster at bottom.) Can’t think of anything else. Oh! Wait! On Wednesday November 23 there is/was Tofflers pre-Thanksgiving Day party-for-patrons (in New Glarus), featuring Ken, Tom, and Derek from the Birddog Blues Band, and special guests Mel Ford on guitar, and Warren Beck on piano. Well, your shame and sorrow and unease and discomfort is understandable, but let us not dwell on it. Let us think, instead, about the good times ahead! 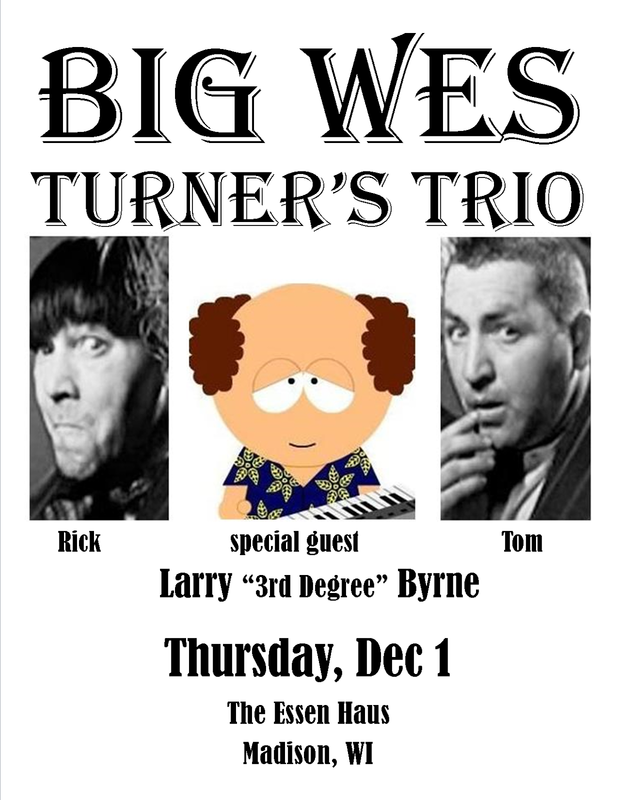 Big Wes Turner’s Trio gets crazy at the Essen Haus with a big assist from the legendary Larry “third-degree” Byrne. Tom sits in with The Cash Box Kings at Chicago’s premiere blues club, Buddy Guy’s Legends. Faux Fawn joins a stellar line-up at the Barrymore Theater for Wintersong, an annual fundraising event for Second Harvest Food Bank filled with new and old Christmas songs. Have fun raising funds for Guitars For Vets at the High Noon Saloon with The Sparks Band (Tom filling in on bass). Host and Emcee, the infamous Ferret de Monte Christo of Count Bop & TheHeadliners. 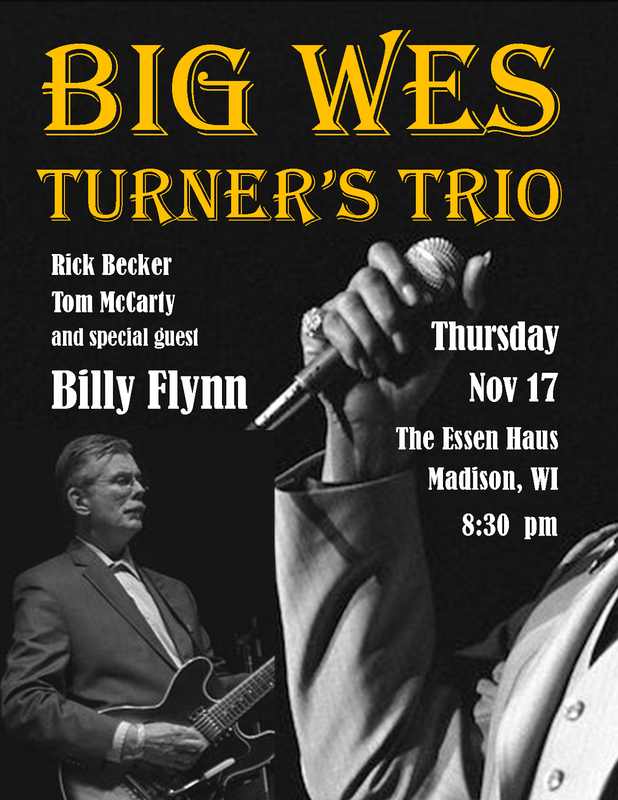 Big Wes Turner’s Trio welcomes back Grammy-winning guitar player Billy Flynn to the lineup at the Essen Haus. Tom jumps onstage to croak out a few holiday chestnuts with The Rousers at their Rocking Christmas Party at The Harmony Bar & Grill. 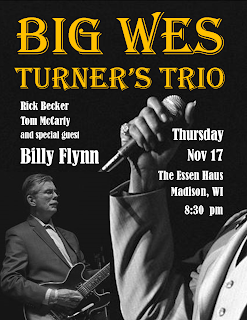 Big Wes Turner’s Trio helps you burn off those third helpings and blow away any leftover holiday blues at the Essen Haus with Billy Flynn on guitar. Ring in the New Year and kick 2016 into the dustbin of History! Tom fills in again with the Cash Box Kings, this time at Madison’s premiere blues club, The KnuckledownSaloon.